All I want for Christmas.... Giveaway! I know many of you spotted the colourful KnitPro Marblz - limited edition - handcrafted needles which I used to photograph the Backwards Bobble Tutorial. They are part of a stunning interchangeable set I was sent to try out and which I will be sending to one lucky reader! The collection includes eight pairs of Marblz interchangeables ranging from 3.5 to 8mm, cables, cable connectors, a needle gauge and a lovely pen. 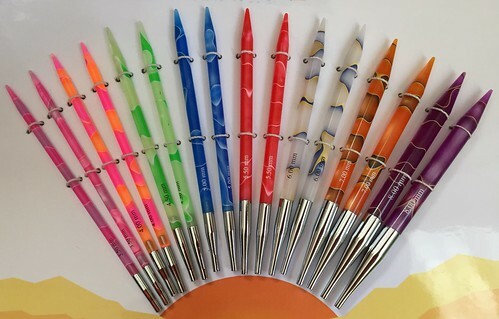 If you are familiar with KnitPro, you'll already know the quality you can expect. These come with black cables (I think they are the same as the Karbonz cables) and can be used with all your other KnitPro accessories, which are widely available. I hadn't tried acrylic tips before, and I'd heard that acrylic can be a bit 'squeeky' but I didn't have that experience knitting cotton/acrylic yarn for the tutorial - in fact the experience was very smooth. These needles are so pretty they might make you want to cast on a project in every size... in co-ordinating colours. They sell for £79.99 in my local shop, and you can get them for £59.99 on Amazon . Of course, if you win them, you'll want something new to knit. I've chosen my very favourite shade of the incredibly soft and squishy DK Merino from the Yarn Stories range (pictured) and you will get 2 balls of that with your needles - I'm not telling you which colour it is as it's always nice to have a surprise - you'll have to take a look and guess. Because good things should always come in threes, you can also choose one of the patterns from my Ravelry store. 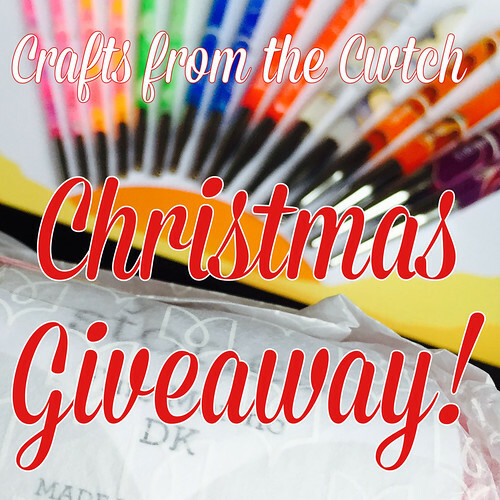 To enter the giveaway, all you need to do is to leave a comment on this post telling me what YOU most want for Christmas! Be sure to leave your Ravelry user name or email address - if you don't do this your entry will not count. The closing date is Friday 5th December - which means that the parcel has a good chance of getting to *most* places before Christmas, provided I get your address quickly. If the winner is in the Far East, Australia or New Zealand it might be a New Year Gift instead. I would like a set of gorgeous interchangeable needles for Christmas so that I can make more gorgeous cardigans for my girls. I would like snow for Christmas, but only once I've arrived in Scotland too see my family - no grounded flights for me this year please! Those needles are awfully pretty, though, I'd quite like them for Cgristmas too! Eh. *To* see my family and *Christmas*! What a lovely gift! Aside from the biggies like health & happiness for my family and friends I've had my eye on a ball winder and a new Filofax! I'd like a new winter coat!! Yarn. I always want yarn, particularly possum yarn. I also want Weldon's Practical Needlework, the new deluxe set from Interweave. Being a Mum to a 2 and 4 year old I would like some more time to knit! I would like there to be peace around the world,,, and some knitty/hooky goodies!! This Christmas I would like some alpacas but as my garden is too small, I would be happy with a jumbo flier for my trusty spinning wheel. I would like a book on Fair Isle knitting, my name is cariadjude on Ravelry. 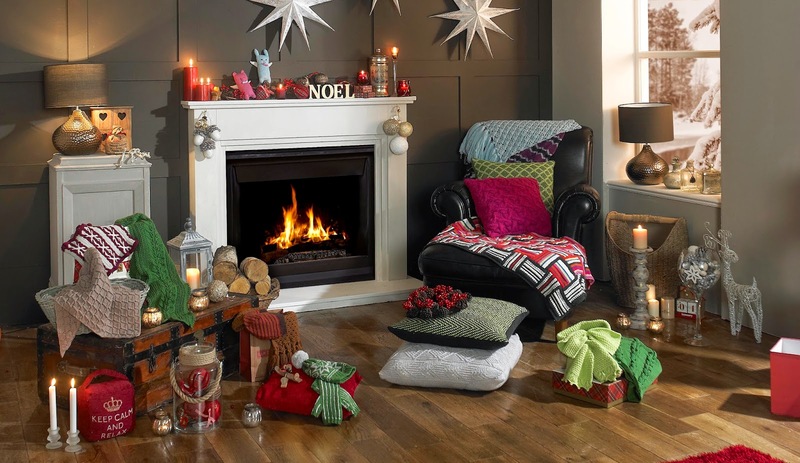 I'd love to have some chilled out knitty time in front of a nice fire, with a lovely hot chocolate! Honestly, I'd love gifts of cash so I can pay down my student and car loans! I'd love a little tv for my bedroom so I can snuggle in bed with a film and my knitting and not have to move! I'd like a bit of quiet knitting time by the fire. Hope you have wonderful Christmas plans yourself and I am looking forward, as ever, to your gift guide - link normally gets sent to my hubby! Thank you for a lovely giveaway. I would like for Christmas anything knitty related or vouchers for Amazon or Craftsy. All I want for Christmas is nice yarn. And I'd love to win these needles to use with the yarn! For Christmas I would like a set of soft handle crochet hooks. I'm Gwenynen on Ravelry. Christmas is spending quality time with my dad with time to knit that's what I would like. I would love a voucher for a hot stone massage for Christmas. I would like some time off work to read books by the beach, in NZ. I've been admiring those needles from afar in my LYS. As for Christmas I would just like to spend it with all of my family, in the same place at the same time. All I want for Christmas is for everyone to be together and enjoying themselves. Could do with some new needles though too ! All I want for Christmas is some peace and quiet, which really means more knitting time, and some snow to make NYC look its best. julylo7 on ravelry. Happy Holidays everyone! After an operation this month I'm hoping to be almost back to my old self. Well, better than my old-self. After that anything crafty-wise would be all I need. Thanks for the chance. Happy Christmas to one and all. Well if I could truly have anything, I would love cruelty to disappear from our world. But materialisticly anything from Anthropologie would be smashing. What I would really ,really like for Christmas is a rescue cat. Blessings to you and your family. I would love to receive a gift certificate to get all my old home movies on VCR tapes converted to CD/DVD's. For my daughters and I not to have to work so that we can spend the holidays together! Oh, and lots of knitting time! What I most want for Christmas, or should I say need, is a new coat where the collar actually lays flat. My poor old coat has seen better days and the collar wasn't cut correctly on the grain so always laid cattywhomper and bothered the heck out of me. The needle set is lovely, I had not seen anything like that before. My Christmas will be nice peaceful spent with lots of quality time with my sticks and string. Happy Holidays to everyone who reads my post! I would like some 'nice' dpn's for socks. Fabulous giveaway. I am lucybowen on Ravelry. Sorry, this might be a duplicate comment because my browser if playing up big time. Time to knit is all I want this year. What I really want for Christmas is a trip home to see my family, but that's going to have to wait. For a material thing, I'd love a kitchen scale (that I would use for both cooking and yarn). Hello! I'm hoping to be able to get my family together...it would be the perfect christmas presente! I'd like a new watch for Christmas - not very craft related I know but that's the truth! Would like some new warm slippers. I would love a new bathrobe and lots of yarn to play with. Those needles are awesome. I also want a crochet set like those as well. I'd love to have more crafting time. And for all my gifts to fit the recipients. For me, last year I, at last, discovered the joy of a wish list. Anything from that would be great. Especially kam snaps which would finish a few projects off nicely. I'm Myfairknitter on Ravelry. My kitchen needs some serious updating, so instead of the yarn I ask for most years, I've asked for some new gadgets to make things a bit easier come meal time. That doesn't mean my heart isn't still yearning for a little knitterly bling! These are so beautiful - I would love to win them! My ravelry name is sitstay. I love a giveaway. All I want for Christmas is to know my boy has a good teacher next year, he certainly deserves one! That new yarn you are using is scrummy, I may just have to sneak a few into my Christmas stocking! I would love anything yarn related :-) susand1408 at gmail dot com. Thanks for the chance to win! Fantastic Prize! WORLD PEACE, CANCER CURED AND YARN FOR FAMILY KNITTING GIFTS... ESPECIALLY FOR MY NEW GRANDSON GRAHAM.. I would love more crafty time so I can finish off the projects I need to egg done before my second little one arrives. What a great giveaway, thank you! For Christmas I'd love some lovely yarn, some knitty things, books, and quality time with my loved ones. Merry Christmas to you and yours! My ravelry name is monicaza. I will be away from my family for the 1st time this Christmas, so beautiful needles, yarn & a pattern would mean I could spend the season knitting something for someone I love. Thanks for providing a great interesting blog this year and I look forward to reading it next year. Seasons Greetings to all! What I'd love most for Christmas would be to fly to London and see the street lights once again. I used to live in the UK and I never found a more magical place around Christmas than London! Love from the south of France.